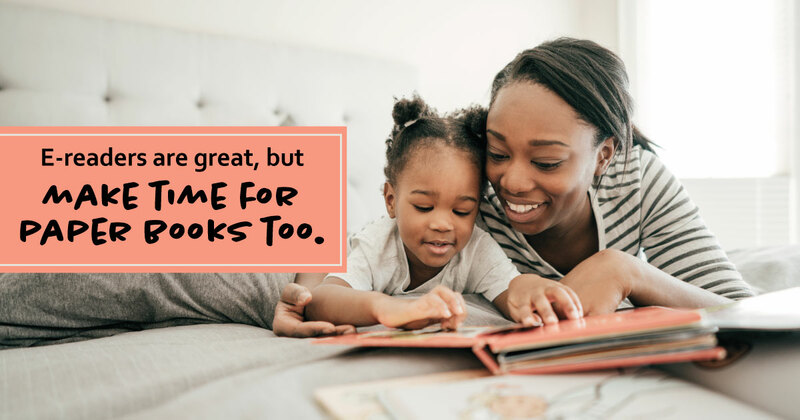 April 12, 2019—When parents read to their toddlers, does format matter? Print books seem to have an advantage over electronic books. That's according to a small study. The study involved 37 pairs of toddlers and their parents. It found that both parties talked and interacted less when reading e-books. When parents and children read print books together, they talked with each other more. Basic e-books on a tablet. E-books with sound effects and animation. Less time talking about the story. More time talking about the e-book technology. The authors of the study said toddlers learn and retain new things better from parent-led talks than from just reading or looking at digital media. When reading print books, parents may point to a cow and ask, "What does a cow say?" Or they might relate to a past event by saying "Remember when we visited a farm?" But this kind of talk happened less often when parents were reading from e-books. The study's authors said it appeared that the e-book enhancements were standing in the way of parent-guided talks during reading. Reading together is one of the most vital activities parents and children can take part in, according to the study's authors. They suggested parents choose print books over e-books. If parents do read to their children from e-books, they should be mindful to engage with their children as if they were reading from a print book. The study appeared in the journal Pediatrics.